As a young bride almost 20 years ago, I proudly sat at my parents’ dining room table, alongside my husband, and emphatically declared that I would never, ever, homeschool my children. I couldn’t understand why anyone would want to take their kids out of a public school setting where trained teachers would handle their education and they would have the ability to socialize all day long. After all, I wasn’t even a college graduate, so attempting to teach my own kids at home, seemed absurd to me. I was never going to do it. Until I had my son! Isn’t it funny how all of your pre-parenting advice you’re so free to give out to others, changes once you have a child of your own?! In what seemed like the blink of an eye, I had a four-year-old who was an early and eager learner. He was teaching himself how to read faster than I could keep up and playing school was his favorite thing to do. So we happily read books together, cut out pictures, and learned how to write letters and numbers while my husband was in seminary. What I didn’t realize at the time, was that I was indeed homeschooling, but without the pressure of thinking I was handling my son’s education, I actually enjoyed it. One year later, my husband and I were in our first pastorate when my already reading five-year-old missed the cutoff for public education. They told us he was too young to enter Kindergarten and we’d have to wait until next year. Hold him back another year? The professionals were suggesting we start him in Kindergarten when he was almost seven years old. That just seemed like a recipe for disaster to me. Put a child who’s already reading in a class that he’s too old for and you have the makings of a child who’s bored. And bored children often cause trouble! It seemed like the only option to me. I reluctantly agreed to try homeschooling for one year, evaluating each year as we went along. I’m happy to say that my son will be a Senior in high school next year and I’ve never looked back. I’ve successfully home-schooled five out of our seven kids, with two of our kids being too little to start yet. I don’t regret my decision for a moment. There are so many benefits to homeschooling. 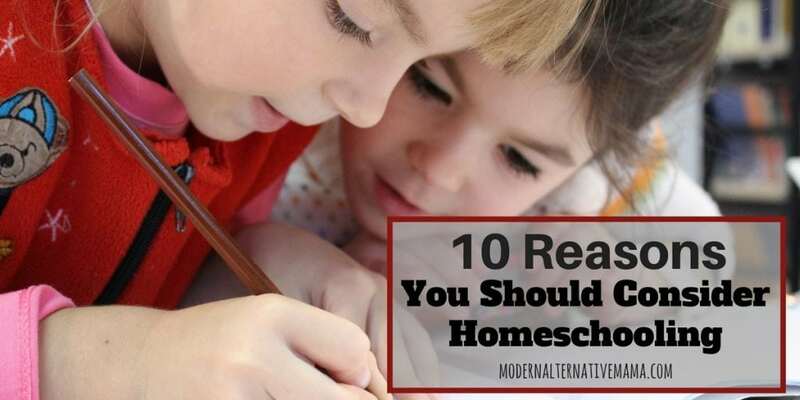 If you’re considering whether or not you should homeschool, then let me, a veteran homeschooling mother, encourage you with a few reasons why homeschooling is something you should definitely think about. It really is true that your kids grow up fast. Blink, and they’re taller than you are. One of the best ways that I’ve found to redeem the time, is to spend it with my kids all day long. Teaching is such a great way to snag every moment, every memory with my kiddos. Since my kids don’t have a bus commute to and from school, we automatically gain time together. I’m grateful for the time I have with my kids. When budgeted properly, your homeschool curriculum should cost a fraction of the price of private education. If you’re careful to choose your curriculum according to your family’s finances, then you should be able to provide your kids with a very good education without mortgaging everything you have. There are many ways to get your homeschooling materials affordably. And the savings will be considerably less than sending your kids to a private school. Private education costs are typically through the roof. Therefore, you should consider homeschooling if your budget won’t allow you to send your kids to a private school. Is Latin history your thing? Do you have a desire for your kids to have a strong grasp on history? How about your religious views? The great thing about homeschooling is that you completely control what your kids learn. Some states have standards that are a little more restrictive than others, but as long as you meet your state requirements, you can always add in additional curriculum to fit your family’s core needs. I teach Bible as part of our homeschool curriculum. It’s important to my husband and me to let our kids know what our values are. Since I homeschool, I’m able to teach our faith as a part of our homeschool day. Since I’m able to control what I teach my kids, it’s easy to add additional material that will reiterate the values we hold to as a family. I remember struggling with math from a very early age. Unfortunately, no teacher ever caught the problem. Or if they did, they never did anything to correct it. As my kids’ teacher, I’ve been able to find deficits in my kids learning throughout the years. Rather than let them slip through the cracks, I’m able to teach for mastery of any given subject. We don’t move on from a certain subject until I have confidence that my kids are grasping and understanding the concept. Not all learning is academic. Kindness, selflessness, patience, etc. are all character traits we can work on throughout the school day. Believe me when I say that when homeschooling, we have many opportunities to work on several of these attitudes and behaviors. I believe that character training is a sweet bonus to choosing to homeschool. Since I’m with my kids all day long I have the ability to correct misbehavior quickly before it takes root and becomes a problem. Homeschooling allows your kids to develop good relationships with each other since they essentially become each other’s peers. Spending time together all day give them any opportunities to develop relationships that are long-lasting. I notice my kids seeking each other out throughout the day, either asking for help with a school subject or gathering an opinion on a project they’re working on. Gym class takes place in our driveway as our kids invite each other to a game of basketball. These are the moments that develop into rock-solid relationships that will stick with them throughout life. We can get our homeschooling day done in significantly less time than the kids in public school. Unlike a traditional school setting, where kids get up early to catch a bus, spend all day in school, ride the bus home, and then come home to do homework, homeschooled kids typically have extra time just to be kids. I’m excited to see my kids develop their own strengths as we continue our homeschool education. My oldest son, who will graduate next year, has been working on his web development skills for about two years. Since we homeschool, we’ve been able to guide him down the path that best fits his abilities. Early on, my husband and I work hard to identify our kids natural bent and then structure their homeschool around it. Rather than fit them into the mold of 30 other kids, they’re able to shine in the way that they were made to! Homeschooling is By Far, The Coolest Thing You’ll Ever Do! There is just something extremely special about being the one to teach my kids. I’m thrilled when I know that I’m the one who taught them how to read, write, and reason. I enjoy the time I’m able to spend with them and the ability to teach them my values and shape their character is priceless. Homeschooling really is pretty awesome! Looking back on the attitude I had as a young bride, I didn’t realize that the very thing I was scoffing at, was the very thing I would one day hold as a treasure. I didn’t realize it then, but I know now that to send my kids to school would be to surrender my time, influence, and connection with my kids. I’m so thankful to be able to say now that although homeschooling indeed involves sacrifice, it is by far the coolest thing I’ve ever done! Have you ever considered homeschooling? Or are you dead set against it? My oldest two go to public school and I’m happy with what they’re learning. I’ve always wondered how families with several kids (or even just two kids) manage to effectively teach each child. How do you spend time teaching when you have little ones running all over, interfering? How about needy babies? It just sounds like a stressful situation for all.